Still render of Winding Roads by Twisted Poly, using Cinema 4D and Octane Render. Staircase Ball by Twisted Poly. Rednered using Cinema 4D and Octane Render. The layout and design we’re an extension of previous still renders Nejc had done arranging things into spherical forms. Those and other renders can be found on his Tumblr. “I wanted to try and continue to make little a series of them. That’s how I got idea of this crazy roads twisted in a ball.” Originally, cars were not even going to be a part of the project, but came about in the process as an extra detail. In the end, Nejc had a nice, polished little piece and learned more about how to use Octane. he leaves us with one last bit of advice. “I encourage everyone to take advantage of any free time and dive into similar fun personal projects.” Learning by doing… and having something pretty cool to show for it. Nejc’s current setup includes a PC workstation with a 3930K over clocked to 4.2GHz, 32gb of ram, nVidia GTX 670 and 780, SSD, and dual displays (27“ + 24”) running Windows 8 with Cinema 4D and After Effects. Our most recent #mochat covered the various rendering options in Cinema 4D. From sketch & toon to physical to Octane to V-ray, posters talk about how and why they use different render engines. This came across my radar last week, and it’s too good to not post. Tumblr (and Twitter) user Sock Gardner has a collection of classic paintings recreated in low-poly 3D. The low-poly thing seems to be just about peaking as a trend, but this seems like a great use of it. This also seems like a great way to practice modeling skills as well. For archival purposes, I’ve included several of the renderings in this post in case the Tumblr goes away or migrates to other posts in the future. Last night on MoChat, we discussed Cinema 4D plugins & scripts. Some presets snuck their way in there, too. There were quite a few handy links & plugins being tossed around. Several I had not heard of, but that’s not saying much since I’m still relatively new to the Cinema 4D community. Below is a list of the resources that came up last night. The full transcript follows. Earlier this week, #MoChat covered the upcoming Cinema 4D R14. While it won’t be released until sometime in September, Maxon did release a limited demo the same day as the chat, so some people were able to play with it and give us their impressions. Dave Glanz, one of the beta team members, was also available to answer questions. Some of the main features people are looking forward to: Sculpting, motion cams, aerodynamics simulation, new work plane modes/snapping, and importing C4D files directly into AE & PS. There are also some smaller features that look to make using C4D a bit easier: new xpresso nodes/UI, rollover popups, and camera morphing. Cineversity has a playlist up covering several of the new R14 features, and C4D Live has been showing presentations from this year’s Siggraph. Hopefully they will have the archives up soon, too. Octane Render is a standalone, unbiased render engine which works with most modern 3D packages. It also uses your CUDA-enabled GPU for rendering. That sounded like a lot of jargon, so let me make this simple – Octane is fast. Very, very fast. Some people will remember a CGTalk thread where the idea of rendering purely from the GPU was dismissed as fantasy. Well I’m happy to report that my opinion has changed completely – it’s fast, accurate and I never want to go back! Like Maxwell Render, Luxrender and the new physical render in Cinema4D R13, Octane will render as long as it can until you tell it to stop. If you’ve never used an unbiased renderer this can take some getting used to, but it’s certainly an enjoyable way to work. What’s unique about Octane (at least to people who haven’t used the hardware acceleration in apps like 3DSMax) is that it renders every change you make directly to the viewport. What you see is literally what you get. All material changes, quality settings etc. are rendered progressively in real time, so there’s no need to sit around waiting for your GI to calculate before you can get feedback on a material. Did I mention that Octane is fast? Let me give you an example. At work, I use a fairly old quad-core workstation with bags of RAM. A 1080p frame with AO, some reasonably complex geometry and soft shadows will take me around 3 and a half minutes to render in Cinema4D’s native renderer. In Octane I can get much higher quality (including, I might add, working AO) in about 1 and a half minutes. Better yet, this is all done on the GPU. All of it. Another little gem hidden away here was the option to undertake a little instant post-work on the fly- as far as I can tell there is no render overhead for things like exposure changes or tonemapping. I should mention at this point that my graphics card is very modest – a nVidia GTX470. It’s certainly not a high end workstation card, but it does a good job with both Octane and general viewport navigation. And this little sub-£180 card is better at rendering a complex 3D scene than my quad-core CPU. So. Octane is fast, it’s interactive, it’s required hardware is relatively cheap. What’s the downside? Well – for one thing it’s In Beta. Yes, a commercial engine in working beta, so sometimes you are left with decisions that feel like least-worse options. You can find examples of these all over the fairly obscure interface, and even to experiences like making a purchase and receiving a license. Secondly, there is no official plug-in for Cinema4D (which I’m going to assume you use if you’re reading this post), “just” an exporter script. Its basic, but enough to get an .obj with material separations into Octane, ready to render. It’ll also send an animation over, too. A recent email from the developers assures me that they expect a C4D official plugin to be released as late as a years time – and it will cost extra. Finally on the Cons side; there’s the realisation that your prior efforts at shading weren’t that great. With the current system, you might as well not bother shading in C4D at all, such is the difference between a material translated to Octane and its counterpart in C4D. I’ve also not managed to find a way to export a full scene including disparate objects from C4D; instead each component must be exported and imported as a discrete node. Summing up: Incredible power, simply mindblowing for those with mid-range or slightly old machines and the right graphics cards. However there’s a big trade-off here in terms of living with quirks and a greatly changed workflow. If you have any questions regarding Octane, I’ll try my best to answer them in the comments or via Twitter. Alternatively, you could head over to Refractive Software and give the demo a try for yourself. Tis the season! 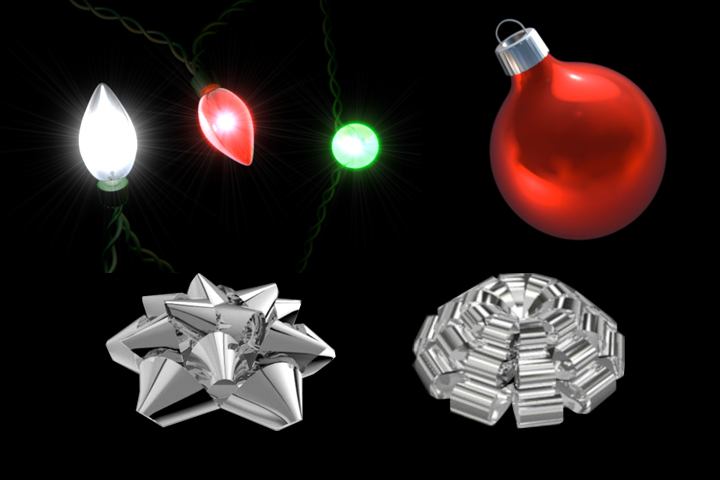 Here are 4 free Cinema 4D models for use in you holiday animations this season! You’ll get the 4 models along with the .OBJ format versions for people using other 3D programs and earlier versions of Cinema 4D. Included in the files are the HDRI textures I used for some of the nice reflections. Enjoy and Happy Holidays! The CINEMA 4D export appears directly in the After Effects export menu and generates a .c4d file containing 3D layers, cameras, lights, solids, nulls and footage. Even nested compositions are supported. All major layer attributes including animations (rotation, position, parameter, anchor points, POI, etc. ), expressions, layer parenting, layer locking and layer visibility are retained. Render and document settings in CINEMA 4D are adapted accordingly to the After Effects’ project settings. We haven’t had a chance to thoroughly test this yet. But when we do, we’ll post the workflow, any potential pitfalls, and workarounds necessary. The plugin is free, so go grab it now!